The word Vicinal comes from the latin “vicinus”, something which belongs to the local area. Nowadays one would talk about local rail transport, with all that suggests in the way of an alternative form of mobility for our fully motorised society. If Belgium can be proud to have inaugurated the first public railway on the continent in 1835, and to have developed a national network, limited in the first instance to the flatter parts of the country, private capital later providing the rest of the network, public authorities neglected to provide services to rural areas which were too poorly populated to guarantee dividends to private companies. The law which founded the SOCIETE NATIONALE DES CHEMINS DE FER VICINAUX – S.N.C.V. (National local railway company) was finally passed in 1885 by King Leopold II, who was anxious to encourage the metallurgical industries and maintain Belgium’s position as second world economic power after England. The largest “little” railway in the world! The idea of constructing light railways at minimum cost to connect areas not already served by railway, using money raised by the state, the provinces, local authorities, and some private capital, was, frankly, revolutionary. These light railways were to run by the side of the road and through the countryside in order to offer a passenger and goods service even in the most remote areas. The lines were financed on the mutual principle, the lines which provided a profit being used to finance the less profitable lines and the transport of agricultural or raw materials guaranteeing moderate passenger fares. The rolling stock manufacturers in the Walloon industrial area designed simple and robust locomotives for the Vicinal, and went on to provide similar products to colonial railways and tramways throughout the world. The vicinal network will grow to reach 5000 km lines in 1935, the year of the world fair in Brussels. At this time the vicinal count more kilometers that the 'big' railway. A unique centenarian public transport company, by 1985 the S.N.C.V only operated a few hundred kilometres of railways (the coastal tramway, the Charleroi network and the Grottes de Han line). In the 1950s the company had to face both fierce competition from cars and lorries and the fact that in view of increasing road traffic it would have cost a sum considered exhorbitant at that time to move the tracks from the public road. For a century the Vicinal was part of the Belgian scene: narrow tree-lined roads, with cobblestones and metre gauge rails. Stations were rare, as the economic Vicinal preferred to stop near the local café, where both passengers and luggage were in good hands. The steam trains of the first years were joined by electric trams in 1894. The success of this new method of traction lead Julien Dulait, owner of the “Electricité & Hydraulique” company (the later ACEC) to produce everything necessary for the new electric tramways. The quality of these products led to the worldwide fame of Charleroi. Another financial magnate, Edouard Empain, operator of the coastal tramway, attempted in vain to extend it to the networks at Lille and Valenciennes, which were also in his ownership. Just before the first world war he foresaw the strategic role which Vicinal light railways could play on the Yser front and created a special organisation to operate them. 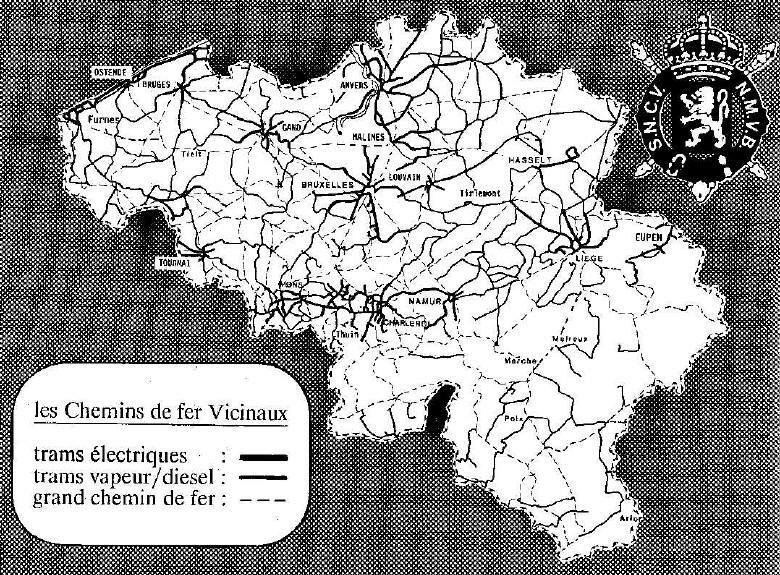 In the occupied part of Belgium, where the railways were “confiscated” by the enemy, the Vicinal assured the majority of passenger traffic and even introduced night trains and services between towns which allowed the hungry population to gain the countryside to buy food. By 1918 half the Vicinal network was destroyed and the private companies which operated some lines as concessionaires on behalf of the S.N.C.V. wanted to end their concessions. The SNCV reconstructed and modernised the network, using modern diesel railcars to replace the steam trams, designed a spacious and comfortable standard electric tramcar and encouraged tourism when the first paid holidays were introduced (1936). The old steam locomotives were kept for goods traffic, which remained profitable. In 1940 these locomotives were again to be seen on passenger trains, as there was no petrol available. During periods of bombing raids it was the tram which kept running, being less easy to locate than the main railways. Peace returned to a changed world, which would see individual motorisation supplant other means of transport. The centenarian company was dissolved in 1991. 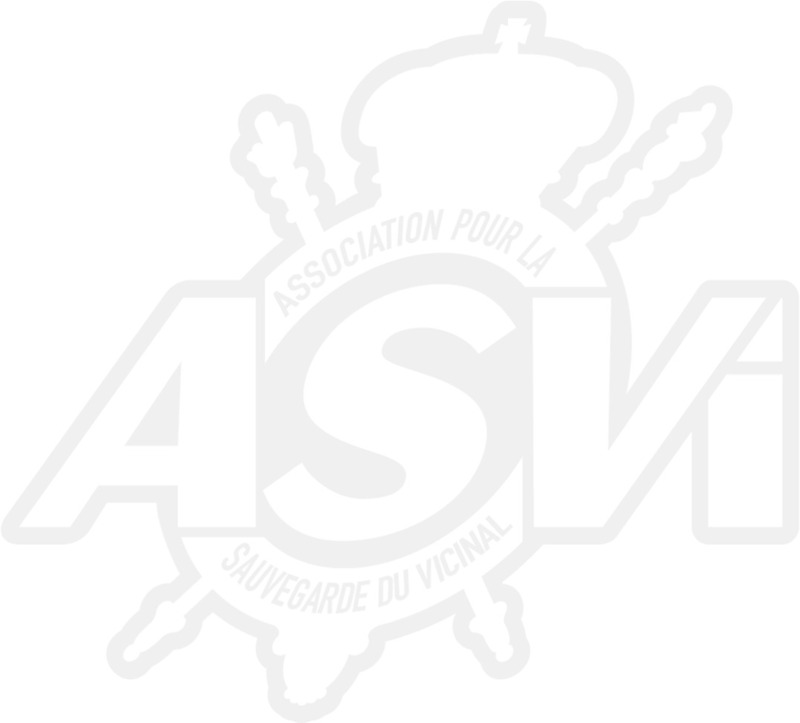 In 1972 a group of tramway enthusiasts created the educational charity ASVi (Association pour la Sauvegarde du Vicinal) in order to preserve and operate old vicinal tramcars. Over the years the association has preserved a collection of more than 40 vehicles, the oldest dating from 1888. Since 1978 the ASVi has operated its trams on the Lobbes – Thuin tram route. In 1984 it took over the maintenance of the line. In order to exhibit the collection and to present the history of the SNCV in an interesting way, the project to create the Vicinal Discovery Centre was started in 1994. The first building was inaugurated on the 1 October 1994, thanks to the efforts of the members and financial aid.